Property Specialists Savills have entered into a partnership to revive what was the most keenly contested angling award in Scotland for the best part of thirty years. By reputation, it is set to once again be 'the' coveted award for any river, ghillie and rod to win. After a ten year absence, the renamed Savills Malloch Trophy was established in 2009 by the River Tay's Charitable Foundation to promote the conservation of salmon and catch and release programmes on all Scottish rivers. Anglers will fish throughout the 2013 season in the hope of catching the heaviest salmon. Fish over 20lbs may be contenders for the Savills Malloch Trophy and all fish to be considered for the Award must have been safely returned in order to qualify. An independent judging panel will meet in December to decide this year's winners. The prestigious Savills Malloch Trophy has recently been reinstated after ten years. It will be presented to the angler who catches (and releases) the largest salmon on fly in Scotland in 2013. For details of the presentation to the 2012 winner click here. All entries will be considered by the Malloch Challenge Trophy committee after the last salmon fishing rivers close on the 30th November 2013. The Malloch Challenge Trophy Committee is made up of representatives from the regions in Scotland and the Chairman of RAFTS. The Committee’s decision in all matters is final and no correspondence will entered into subsequent to the award winner being announced. The winner and their guests and representatives of the Trust on whose river the fish was caught, will be invited as guests to a formal presentation. Criteria for application for the Award are detailed below. Entry forms are available below or can be obtained from the Tay District Salmon Fisheries Board office on 01738 583733. Entry form: The Savills Malloch Trophy entry form must be duly completed and signed as required and returned to the Savills Malloch Secretary as soon as possible and no later than one month after capture (except in the case of a November capture, where the entry form must be returned by c.o.b. on 7th December 2013). For entry form click here. The fish must be a bone fide wild Atlantic Salmon; must be caught on recognised artificial fly tackle and artificial fly in an approved manner; and must then be returned safely to the water. Full details including fishing tackle used (rod, reel, line, leader and fly) should be recorded as should the date, place and time of capture. Witness/Photograph: The capture must be verified by a minimum of one independent witness and wherever possible with accompanying photographic evidence. Weight: Ideally the salmon should be carefully weighed in either a weigh-net or with scale and net, the weight of the net being deducted. The weigh-net or scales should be available for independent testing if required. Alternatively Sturdey’s formula will be used to assess the weight of the fish in the event that the fish cannot be weighed. History: The Malloch Challenge Trophy is named after the Perth-based manufacturer and retailer of fishing tackle, Mallochs of Perth – one of the most legendary names in Scottish tackle history. Its founder was P D Malloch, one of the greatest authorities of his day on salmon. 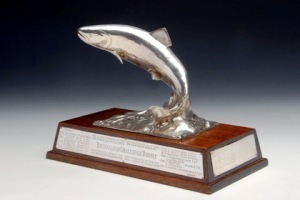 The Malloch Trophy was first awarded in 1972 for a 43lb fish caught on the Tweed by Lady Burnett and last awarded in 1999 following a run of 28 consecutive years for a 33lb fish caught on the Spey by Mr J Montupet; during this time the winning fish came from a variety of rivers including the Dee, Spey, Tweed, Tay and Naver. 2 ladies apart from Lady Burnett have been winners of the trophy with fish from the Tweed (33lbs) and the Spey (35lbs). After 1999 the trophy was not presented and remained locked in a cupboard for over 10 years and was lost to the salmon fishing world until the Tay Foundation was able to acquire it. 2009 – River Tay’s Charitable Foundation form partnership with Savills to launch the Savills Malloch Trophy with the aim of promoting conservation.